British surveyors and Native American leaders drew a border along the Appalachians. Then the Revolutionary War happened. Picture this: In the 1760s, a team of colonial surveyors meets a group of leaders representing major Native American tribes in what will one day become the southeastern region of the United States of America. Together, they head out into the woods. Their task is to mark a negotiated border, by planting posts and notching trees, that will show where colonial settlers’ territory ends and tribal territory begins. They have a list of landmarks that are supposed to mark this division, and as they travel, the tribal representatives watch to see where the border lies and to correct the colonial surveyors when they go off course. In some places, the surveyors marked a royal cipher on one side of a tree, while the tribal representatives make their own marks, now forgotten, on their side of boundary. On one key summit in the Blue Ridge Mountains of western North Carolina, to make the location of the line extra clear, colonial commissioners and Native American headmen even carved their names on trees. This joint British/Native American survey was an entirely unique effort in the history of American mapmaking. At no other time did the British government attempt to negotiate and systematically mark a border with the tribes they had displaced and encroached upon. 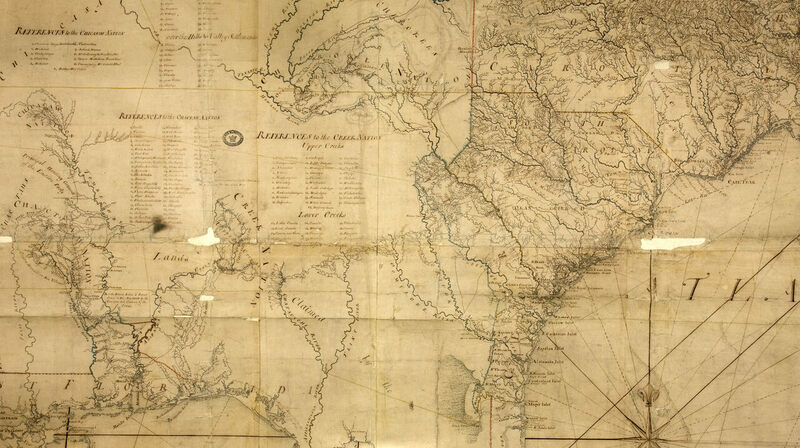 But as S. Max Edelson, an associate professor at the University of Virginia, shows in his book A New Map of Empire, this project was part of the Empire’s attempt to control its colonial territories through the technical tools of surveying and mapmaking. The effort established a boundary through North America—from the Mohawk River in New York, down through the Appalachian Mountains to Florida, and around the Gulf Coast to the Mississippi River. From the crown’s perspective, the land on both sides of this line still belonged to Britain, but the government officials who led these negotiations believed the effort could limit conflicts between Native American tribes and British colonial settlers by prescribing where each group could live. In the 1760s, the government in Britain was taking a new approach to its vast colonial holdings, and in 1763, colonial governors and tribal leaders met in Fort Augusta, Georgia, for the first of 10 congresses at which they negotiated a geographic separation. The king had ordered that there should be a limit to colonial expansion—if a tribe claimed a stretch of land, a colonial governor was not supposed to grant it to settlers. The Fort Augusta meeting began with the tribal representatives describing what they believed to be the extent of their territory. Over the course of several congresses, the diplomats agreed on a boundary between tribal lands and the seaboard colonies. This negotiated line was supposed to limit conflict for the foreseeable future. There are few records of the survey parties that went out to mark the border agreed upon at these summits. Most of the information Edelson found came from the maps themselves, many of which are held today in the National Archives of the United Kingdom. It’s likely, he says, that the Native American representatives traveled along as observers and ratifiers—not doing the technical survey work, but rather making sure the line was marked in the correct places. One boundary map he found includes the names and signatures of the tribal representatives—Emy of Estatoe, Ukenka or the Wolf, and others. Presumably they had been asked to sign off on the map as drawn. The British government’s Board of Trade, according to Edelson’s research, was motivated at the time by an emerging literature of political economy that argued that harmony and growth came from balancing the interests of the parties involved in a conflict. The effort to negotiate and map this boundary line was forward-thinking for the time. “They spent real money trying to create a settlement that would allow Indians and colonists to live together in some kind of harmony,” says Edelson. Given the prejudices of this era, though, and the inexorable colonial push west, it was a doomed effort. “We love to imagine an alternative to what we got, this genocidal dispossession, but there wasn’t that much space for that to be real,” says Edelson. Even as the boundary was being surveyed, parts were being renegotiated. The project was finally completed in 1774. The beginning of the war for American independence, which began the next year, destroyed any possibility that the border would be enforced and restrict further colonial settlement. To the extent that this joint survey effort had any lasting effect, it can be seen in the borders of current U.S. states: Some parts, such as the square-shaped notch on the North Carolina/South Carolina border, which once contained Catawba land, still run along the lines negotiated in the 1760s. It may have been more about social and trade relationships than geography.